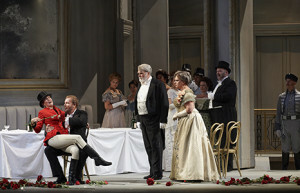 On February 4 at 8 p.m., the Bay Area’s Classical KDFC will broadcast a 1980 San Francisco Opera performance of Richard Strauss’ romantic opera Arabella starring soprano Kiri Te Kanawa in the title role, soprano Barbara Daniels as Zdenka, tenor William Lewis as Matteo and baritone Ingvar Wixell as Mandryka, with German conductor Wolfgang Rennert. This performance from the Company’s archives will be hosted by KDFC radio announcer Dianne Nicolini. The capstone of the artistic partnership between Strauss and librettist Hugo von Hofmannsthal, Arabellapremiered in 1933 and quickly joined the artists’ other collaborations including Elektra, Der Rosenkavalierand Die Frau ohne Schatten in the repertories of opera companies around the world. Set in Vienna’s golden age, the opera follows Arabella, a beautiful young woman who is expected to marry for wealth to save her family from financial ruin, but she yearns for a soulmate. The opera, which features one of Strauss’ most lush and refulgent scores, premiered at San Francisco Opera on October 29, 1980. New Zealand soprano Kiri Te Kanawa sings Arabella, one of her most celebrated portrayals, for which theSan Francisco Chronicle praised her “voice which spins lines of precious tone, soaring softly or arching out to you, always in a living, dynamic state.” A few months after her critical and popular success in Arabella at San Francisco Opera, Te Kanawa’s fame grew to unprecedented proportions when she sang at the royal wedding of the Prince and Princess of Wales, a televised event seen by an estimated 750 million people. American soprano Barbara Daniels portrays Arabella’s lovesick sister, Zdenka. Swedish baritone Ingvar Wixell, a San Francisco Opera favorite since making his American debut with the Company in 1967, portrays Mandryka and William Lewis sings the role of Matteo. German conductor Wolfgang Rennert leads the San Francisco Opera Orchestra in this classic performance. Classical KDFC can be heard on the FM dial at 90.3 (San Francisco), 89.9 (Wine Country), 92.5 (Ukiah-Lakeport), 104.9 (Silicon Valley), 103.9 (Santa Cruz and Monterey); on Comcast Cable 981; or online at kdfc.com. 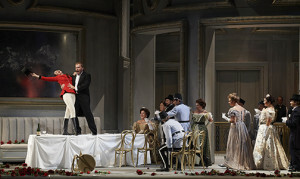 The historic Arabella performance from 1980 may also be streamed on demand at kdfc.com up to four weeks following the February 4 broadcast. Kiri Te Kanawa (Arabella), Barbara Daniels (Zdenka), William Lewis (Matteo), Ingvar Wixell (Mandryka), Alexander Malta (Count Waldner), Sona Cervena (Countess Waldner), Michael Ballam (Count Elemer), John Brandstetter (Count Dominik), Kevin Langan (Count Lamoral), Erie Mills (Fiakermilli), Rebecca Cook (Fortune-Teller), Lee Woodriff (Djura), Karl Saarni (Jankel); conducted by Wolfgang Rennert. Recorded November 1980.